In large bowl, beat 1 cup butter and the granulated sugar with electric mixer on medium speed until light and fluffy. Beat in egg and vanilla until well blended. On low speed, beat in flour, baking powder and salt until well blended. Cover with plastic wrap; refrigerate 1 hour. Heat oven to 400°F. Divide dough in half; keep 1 half refrigerated. On lightly floured surface, roll out other half of dough to 1/2-inch thickness. 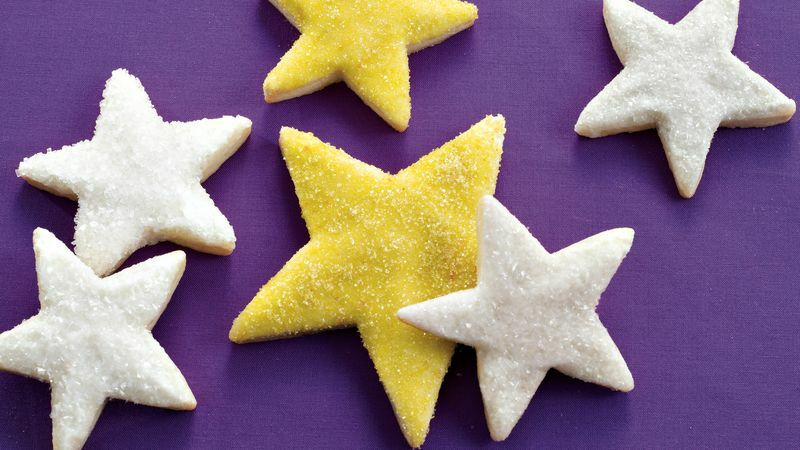 Cut with floured 4- or 5-inch cookie cutters. On cookie sheet, place cutouts 1 inch apart. Repeat with remaining dough. Bake 6 to 10 minutes. Remove from cookie sheet; cool on cooling rack. In small bowl, mix powdered sugar, 2 tablespoons butter and 4 tablespoons milk. Stir in enough remaining milk to make glaze smooth and thin. Tint with food color. Working with 1 cookie at a time, hold edge of cookie to dip into glaze; allow excess glaze to drip back into bowl. Immediately decorate with sprinkles. Let stand until set.